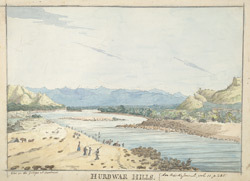 Water-colour drawing of Hurdwar (also known as Haridwar) by James Tillyer Blunt (1765-1834). Blunt served with the Bengal Engineers from 1783 to 1810, chiefly on survey work. The reference on the front of the drawing to the 'Asiatic Journal', ii, appears to be inaccurate. Haridwar, situated in the foothills of the Himalayas is the first major town on the River Ganges at the point where the river flows onto the plains. The town has always been a major pilgrimage site for Hindus as it is seen to be blessed by the trinity of Lord Shiva, Vishnu and Brahma. The Ganges here is quite calm and clear and the many bathing ghats are always full of people performing their ablutions. The main bathing ghat at Haridwar is Hari-ki-Pari which reputedly contains a footprint of Lord Vishnu embedded in a stone.